Separate sitting area complete with a leather sofa, table and chairs. 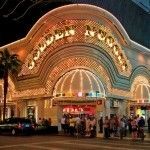 At The Golden Nugget, Resort Fees are ﻿﻿charged ﻿﻿$27.50+tax/night and are mandatory. The GOLDEN NUGGET offers 2 distincts pool, the TANK POOL and the HIDEOUT POOL. Featuring a shark aquarium in the middle of the pool with a waterslide inside! Only for guests ages 21 and older!